Miles Morales is a teenager from Brooklyn who is struggling to adjust to the elite boarding school in which his parents have enrolled him. His father, Jefferson Davis-Morales, is a police officer with all of the sense and duty such a responsibility entails. He also frequently expresses annoyance over the efforts of a masked vigilante the public knows as Spider-Man. Feeling he has no one to speak to, he frequently seeks out his uncle, Aaron Davis, for advice. Aaron encourages Miles’s passion for graffiti, leading him to an abandoned subway station where he his nephew is free to draw to his heart’s content. Things take an interesting turn when a radioactive spider bites his hand. Before the story has a chance to begin in earnest, I must remark that I like how Spider-Man is a point of contention between Miles and Jefferson. While Spider-Man is widely admired, it stands to reason that, as a police officer who risks his life every day unmasked and without superpowers, he would be disdainful of him. Indeed, the introduction of Into the Spider-Verse provides a perspective not often seen in a superhero story: those of the ordinary civilians. These kinds of stories typically focus entirely on the superhero in question. The story’s placement in the character’s life usually doesn’t make a difference. If it’s an origin story, the first act grants the protagonist their superpowers while the second sees them becoming acclimated to them. The sequels would then offer a different kind of struggle despite having superpowers the entire time whether it’s by losing them or facing a seemingly insurmountable threat. Both types of story hinge on a common factor: there typically doesn’t exist a superhero before the protagonist receives their powers. Conversely, in Miles’s world, Spider-Man has been helping the people of New York City for an entire decade. He has had more than enough time to establish his legacy, which is shown in brief snippets to the audience. We see how his uncle, Ben Parker, impressed upon Peter Parker the great responsibility that comes with great power. From there, he has both saved the city on numerous occasions and been on many adventures. This includes one moment in which he danced awkwardly in the streets pointing to random people, though he would rather you forget that ever happened – understandably so. Most of the citizens adore him, making comic books and television shows about him. All of this goes to show how important Spider-Man is to the people of New York City. It is, then, quite shocking when he dies at the end of the first act. After he begins developing his powers, Miles returns to the abandoned subway station to investigate the spider that bit him. There, he accidently stumbles upon a secret laboratory owned by the notorious crime lord Wilson Fisk – better known as Kingpin. He has built a particle accelerator to access parallel dimensions. His wife and son got into a fatal car accident following his previous fight with Spider-Man, and he hopes to seek out alternate versions of them. Realizing that such a device could cause multiple realities to crumble, Spider-Man is there to stop him. In the middle of the fight, he finds Miles. Sensing that they’re alike, Spider-Man offers to become Miles’s mentor, but the collider explodes, severely wounding him. He gives Miles a device to disable the collider before Fisk arrives on the scene. Bellowing out an enraged scream, Fisk kills Spider-Man. Part of what I like about these self-contained superhero stories is that the writers aren’t restricted by a status quo. 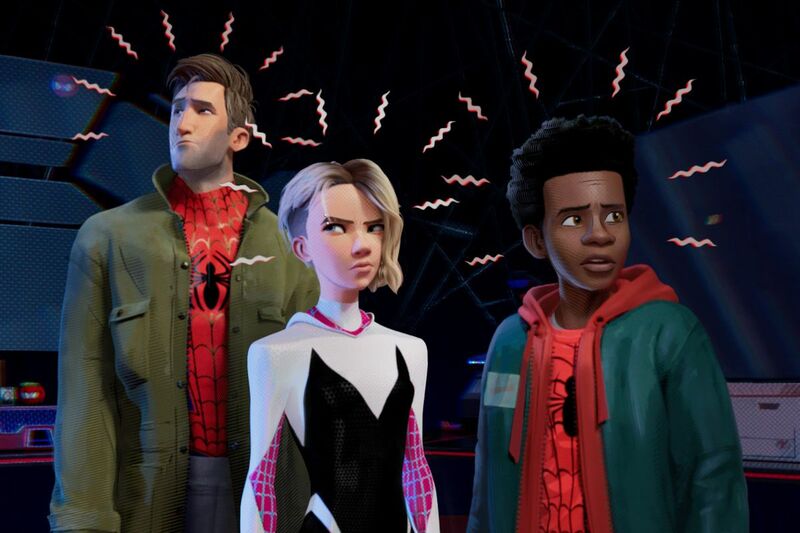 Indeed, Christopher Miller, who produced Into the Spider-Verse alongside filmmaking partner Phil Lord, said it would feel different from its live-action predecessors, “[standing] on its own as a unique filmgoing experience”. The death of Peter Parker seems to punctate this goal. In the Marvel Cinematic Universe films, it’s not typically a question of if the heroes are going to win, but rather how they will go about doing so. Because of this, I was convinced the film was bluffing. I was wrong; in this story, Peter Parker is well and truly dead. There is no cosmic device that will bring him back to life by the time the credits roll, either. In a deft subversion of expectations, one of the first theatrically released animated Marvel films successfully drives home just how high the stakes manage to be to a greater extent than a majority of the live-action installments within the Marvel Cinematic Universe. Though Miles still hasn’t learned to control his powers, he soon finds he is not alone in his quest. Shortly after visiting the grave of Peter Parker, Miles is approached by Peter B. Parker. This is an alternate version of Spider-Man who has been helping New York City for twenty-two years. He is jaded, having separated from his wife, Mary Jane, but wishes to return home. As Miles inadvertently destroyed the device in an attempt to use his powers, they must steal information on how to repair it from Fisk’s company. There, they are confronted by Fisk’s assistant, Olivia Octavius, this universe’s version of Doctor Octopus. Stealing her computer, the Miles and Peter B. flee from the building. During their escape, they meet Spider-Woman, who had been masquerading as Wanda, the new student at Miles’s school. Her real name is Gwen Stacy. She too hails from another dimension. She has been Spider-Woman for two years. The most affecting moment of her life was when she lost her best friend, Peter Parker. Ever since that day, she hasn’t made many friends, unwilling to expose anyone to danger. When she takes Miles and Peter to the house of May Parker, it turns out she is sheltering more alternate versions of Spider-Man. This includes Spider-Man Noir, Spider-Ham, and Peni Parker– a private detective from the thirties, cartoonish pig, and expert roboticist from a futuristic world who shares a telepathic link with the radioactive spider that empowered her respectively. Though I have to remark that these characters aren’t fleshed out as well as Miles, Peter B., or Gwen, they do lend an excellent sense of variety to the proceedings. The greatest strength of Into the Spider-Verse is that, to a greater degree than any of the live-action Marvel films, you get the sense you’re watching a comic-book adaptation. This allowed the team to feature many elements that would seem jarringly out of place in a live-action work such as word balloons, internal monologues, or scene transitions in the form of comic-book panels. This is also what allowed the team to go off the rails and successfully introduce these three wildly different interpretations of Spider-Man – all of whom are drawn in different art styles, evoking the pulp fiction era, Looney Tunes, and anime. All of these disparate elements manage to complement each other very well, and the characters have an excellent dynamic as a result, leading to many nice character moments. Spider-Man Noir is utterly baffled by a Rubik’s Cube due to being from a monochromatic universe, Peni Parker is easily able to repair the broken device because she hails from a futuristic world, and Spider-Ham, being a cartoonish pig, attacks using classic Looney Tunes weapons, culminating in his crowning achievement in which he drops an anvil on Scorpion’s head before finishing him off with a mallet. All the while, Miles and Peter B. have an interesting dynamic in which they help complete each other’s arc. At first, Peter B. is the reluctant mentor to Miles, which itself is an interesting contrast to the brief interactions the latter had with his own universe’s Peter. As the film goes on, Miles’s lack of experience compared to the other Spider-People becomes apparent. This prompts Peter B. to volunteer to stay behind and ensure his comrades make it back to their universes – even though doing so will cause him to fall apart on a molecular level. While this sounds like the standard heroic sacrifice, it’s also shown to be the result of Peter B.’s insecurities. By doing this, he is running away from his problems – the friction between him and his wife. It is through Miles’s determination and idealism that he eventually rediscovers those values, allowing him to take the first step towards reconciling with Mary Jane. Otherwise, the most shocking moment in the film occurs when Miles retreats to Aaron’s apartment. To his shock and confusion, Prowler, Fisk’s top enforcer, appears on the scene. When he unmasks himself, Miles finds himself looking at the face of his uncle, Aaron. The two come to blows later on, though Aaron refuses to kill Miles when he learns he is the new Spider-Man. As punishment for his hesitance, Fisk shoots Aaron. Miles tries his best to get Aaron to safety, but the wound proves fatal. What I like about this development is that it has a true purpose beyond mere shock value; it creates a dark parallel with the more familiar Spider-Man lore. Peter Parker accepted the responsibility that came with his powers after he failed to stop a criminal who would, in turn, kill his uncle, Ben. Meanwhile, Miles’s own uncle, Aaron, is a criminal himself. It is the exact moment in which Aaron begins to act responsibly that he is executed for his insubordination. Nonetheless, it is when he feels the full gravity of his uncle’s death that he finally begins honing his powers. This allows Aaron to have the same impact on his nephew as Ben – even if the circumstances were wildly different. This culminates in a specular final ending wherein Fisk activates the collider, and the heroes must work together to prevent a complete interdimensional collapse. It is exceptionally well animated, as you can see the heroes trying to keep the various realities from dissipating. No good superhero film would be complete without a memorable final battle, and this one manages to stick the landing beautifully. 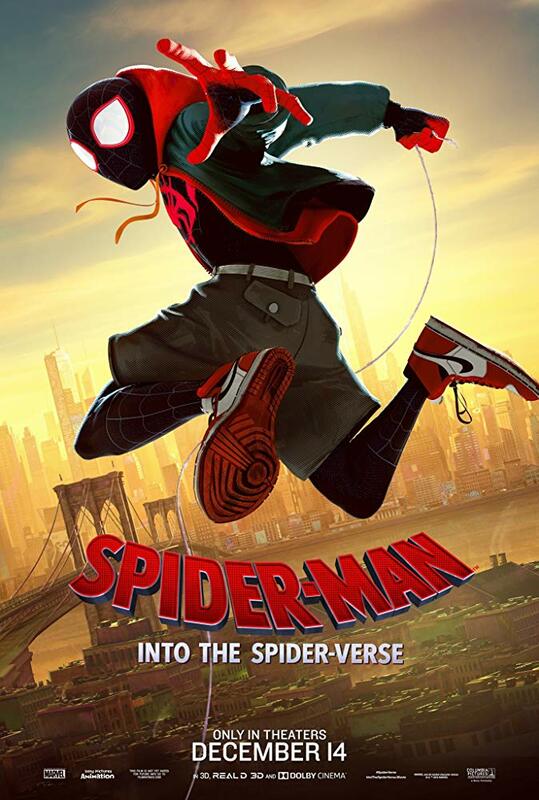 The universes are saved, Miles establishes himself as the new Spider-Man, and he is even able to keep in touch with Gwen after she leaves for her home dimension. I find it thematically appropriate that Into the Spider-Verse was released in the same year as Incredibles 2. This is because 2018 had not one, but two quality animated superhero films that resonated with critics and audiences alike. Though both were doubtlessly good, I have to say that Into the Spider-Verse is the superior effort. It creatively plays around with the lore of a character who had appeared in eight twenty-first century films prior to December of 2018. The result is a work with countless recognizable elements, while still having several interesting spins put on them, giving us an experience that is equal parts familiar and new. One of the easiest traps this film could’ve fallen into would be to use these elements for the sake of fan service, receiving a pass despite having a weak plot. Actually watching the film reveals it’s much more sophisticated than that. With its good writing and memorable characters, Into the Spider-Verse is a film I can recommend to anyone – comic book fans or not. This was a really great movie, one of my favorites of the year. I was pleasantly surprised. I think I liked both animated super hero films this year more than any live-action super hero films of the past few years (Black Panther was good, but not quite worth the ridiculous praise, I think). Not sure if I liked it as much as Incredibles 2, but it’s a close call. I’d say an 8/10 is probably what I’ll rate it (working on my review, plus a few others, right now). Though I may also lower Incredibles 2 to an 8/10, not because I think less of it, but I do want to make my scores really mean something, and making a film I liked as much as Incredibles 2 an 8/10, I think that’s a good idea of what I want the scores to be. This may sound odd, but my favorite animated film this year might be Ralph Breaks the Internet (despite the title). As much as the deviation from the video game to internet theme seemed disappointing, it told an excellent story that built on the character development of the first film in a great way. It felt like what a sequel should be. I think my only real complaint with Spider-Verse was its villain scenario. Although I liked what they did with Kingpin’s motivation, his story never really seemed to click. And then Spider-Man’s best villains (Green Goblin and Doc Oc) felt completely wasted as henchmen. Otherwise, an excellent movie. I have little doubt this film will make my top 10 for 2018; it was really good. Ultimately, I think Into the Spider-Verse is better than Incredibles 2 because it still felt fresh despite the abundance of Spider-Man films whereas Incredibles 2 felt like a token sequel. It was a well-made token sequel, but an example in my mind nonetheless. I have yet to see Ralph Breaks the Internet, though that’s because I haven’t seen the original yet. With Infinity War having left things in limbo until its sequel comes out, I think I could declare this the best superhero film of the year. And I agree that Black Panther got a little more love than it deserved, though I have to say that if the critics are going to overrate something, it’s better they overrate something good, rather than something mediocre/bad. I didn’t have a problem with Kingpin or his henchmen because I liked how it took familiar pieces of lore only to put new spins on them, but I totally get where you’re coming from. Fortunately, the heroes were spot-on. Yeah, it’s definitely in my top 10 of the year, probably top 5. It really is great. And Ralph’s “victory” isn’t so close, as I flip between it, Incredibles 2 and Spider-Man. But Ralph pulled at the heart strings the most. Go ahead and call me cheesy about that, but I think it counts for something. Spider-Man is definitely the most original though. Yeah, Black Panther was good, but it is a little stumping how it’s the first super hero movie to get this level of hype (Best Picture buzz, etc.). I actually liked Infinity War better. But yeah, better to see something like Black Panther get that kind of praise than just another Oscar bait picture. Yeah, I don’t know what it was exactly, but somehow, Kingpin’s story didn’t quite click for me. It’s hard to explain. And considering there are already sequels and spinoffs in the pipeline, it feels a shame they already got so many of the big villains out of the way (admittedly, the whole multiverse setup does allow them an opportunity to reinvent the villains again and again, but will they promote the villains they already got out of the way?). The heroes were terrific though. I’d love an entire film focused on the three ‘secondary’ heroes (Noir, anime and cartoon pig). That’d be a hoot! I would definitely place Spider-Man: Into the Spider-Verse as one of my favorite movies of 2018. And it came right at the end too. It’s one of the only movies I did not find myself getting slightly bored while watching. Into the Spider-Verse was something special, alright. I have no doubt it will make my top ten, though I won’t form the list until the end of January when the last of the 2017 films are released. I was immediately sold through the visuals in the trailers… I haven’t felt that sense of seeing something so new and innovative since the first Toy Story. The use of comic art aesthetic (ben day dots, paneling, word box/bubbles) is fantastic! But I was also impressed at how much heart the story had. It’s easy to think that a story about parallel universes could easily fall apart into something dumb but it all works because of the dedication to the characters. Sorry, I somehow forgot to respond to this comment. Anyway, yes, Into the Spider-Verse was very creative from a visual standpoint in how it seemed to blend two mediums together. And you’re right; the story had a lot of heart to it – the writers clearly knew what they were doing when they incorporated these alternate versions of Spider-Man. Though not all of them receive the same level of development, none of them feel redundant or out-of-place – an impressive feat given the various art styles present. It is easily one of the best films of 2018.